Most of the illegal border crossers from Central America who arrived in last year's surge have skipped out on their hearings, according to immigration court statistics obtained by Fox News. Only about 1 percent of the total have been awarded legal status or relief from deportation by immigration judges, but a significant number (37 percent) of the unaccompanied juvenile arrivals have had their cases closed or terminated, which indicates that they most likely also will be allowed to avoid deportation. In spite of these facts, yesterday the Obama administration announced that it will release the few illegal crossers who were detained, as well as any new arrivals who "state a claim" for asylum. The immigration court statistics are the latest evidence that the Obama administration's response to the surge has been an utter failure. Very few of the aliens are cooperating with the generous due process that they have been allowed. Only a small number are qualifying for asylum. Most concerning, it is now clear that very few of the illegal arrivals will ever be repatriated, even if they fail in their request for asylum or other status, and that the administration's repeated assurances that they would be sent back were insincere and misleading. The statistics were obtained by Fox News from the Executive Office of Immigration Review, which runs the immigration courts and is an agency of the Department of Justice. 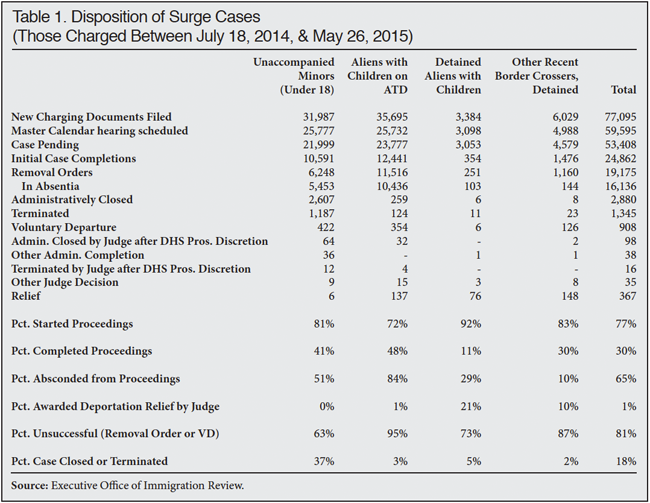 These figures cover those illegal aliens who were put into deportation proceedings between July 18, 2014, and May 26, 2015. No information is available on what has happened to the 85,000 unaccompanied juveniles and 50,000 parents and children who arrived before July 2014. In total, only about 12 percent of the aliens in this sample had been detained. Only 9 percent of the adults with children were detained. The 9 percent have been the beneficiaries of an intense and emotional (and now successful) campaign to pressure the administration to release them and to end use of immigration detention altogether. While the proceedings have begun in most cases, fewer than one-third of the 77,000 have concluded, indicating that the administration's process is far from efficient, especially for those in detention — the population that ought to be receiving the swiftest processing possible. Not surprisingly, there is a stark difference in compliance rates for aliens who are detained vs. those who have been released: 84 percent of the adults with children who were released from custody subsequently failed to appear for their court hearings. In contrast, 29 percent of the adults with children and 10 percent of the other adult illegal border crossers skipped out on their hearings. How could any detained person flee from proceedings, especially when the proceedings often occur right in the detention center via videoconference? It is because some of those labeled "detained" in fact were detained only for a time and then were released from custody, giving them the opportunity to abscond. These very low compliance rates indicate that, contrary to the claims of advocacy groups, very few of the illegal aliens in the surge could have arrived with the intention of pursuing an asylum claim based on fear of persecution or danger in their homeland. Instead, as the Border Patrol found at the time, their goal was to receive a "permiso", which is the actually the Notice to Appear, or immigration charging document. The compliance rate for unaccompanied juveniles was better (41 percent), but still fewer than half showed up for their hearings, which can hardly be called a success. Absconding is probably the smartest choice for most of these illegal aliens. Court statistics reveal that only a very tiny share — 1 percent overall — are succeeding in obtaining legal status in immigration court. The success rate is higher for detained adults with children (21 percent). That is likely because the administration has provided legal counsel to those in detention and those advocates can provide aliens with the right buzzwords to enable asylum adjudicators to grant their requests. It is likely that a number of the aliens whose cases were terminated by immigration judges (mostly juveniles) were thrown out because the aliens may have received asylum or the special green card for juveniles (Special Immigrant Juvenile Status) from USCIS, the immigration benefits-processing agency. A larger number were administratively closed or simply washed out of the system under the administration's sweeping application of "prosecutorial discretion". In total, 37 percent of the juvenile cases were closed or terminated — which means the aliens get to stay. While the vast majority (81 percent) of these cases concluded with the alien being ordered removed or ordered to depart voluntarily (of their own accord within a certain time), this does not mean that any of these aliens have actually departed the United States. These statistics refer only to initial case outcomes, which can be appealed. Or the aliens can simply ignore the removal (or Voluntary Departure) order. Currently there are more than 900,000 aliens who have been ordered removed, but who have not departed. Of course, ICE attorneys can appeal any grants of relief awarded by immigration judges, just like they can appeal any court orders to release aliens, but that would be a real career-killer nowadays. ICE has yet to disclose how many of the illegal aliens apprehended in the surge have been removed, with or without an immigration court hearing. Given the very small number of Central American arrivals who are able to qualify for relief, and the very large number who are not showing up for hearings, the administration should be pressed to explain its recent decision to henceforth allow the release of arriving adults with children when it is clear that they are going to remain as illegal aliens. The administration's actions are practically begging Congress to step in to restore some semblance of enforcement to curb the continuing influx over the southern border.